If you’re not stuck in the past, the Expert is the single-coil guitar that you’ve been looking forward to. It combines tradition and moderism, and is available in three pick upconfigurations. It’s noiseless with a single-coil sound that has rarely been heard. Our guarantee against detuning is its non-locking tremolo mounted on ball bearings combined with oversized Vigier locking tuners. 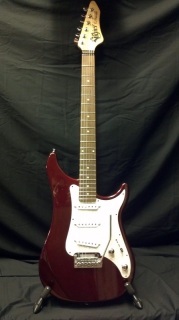 This is a three single coil guitar made for Expert ears. The Expert Texas Blues features a DiMarzio Area ’61 in the neck, a DiMarzio Virtual Vintage ’54 in the middle and a DiMazrio Virtual Vintage Heavy Blues 2 in the bridge.